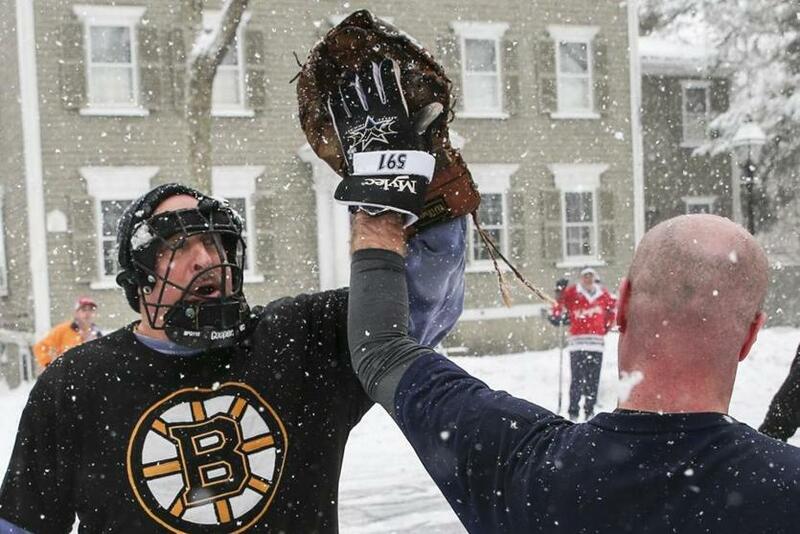 Ware Cady Jr. made a play on the ball during a snowy game on Chestnut Street in Salem on March 10. SALEM — It was about 10 minutes before game time when the snow began to fall on Chestnut Street, quickly turning the street into a slippery mess. The players continued putting on their gear, and there was no mention of calling the game. Not this crew. 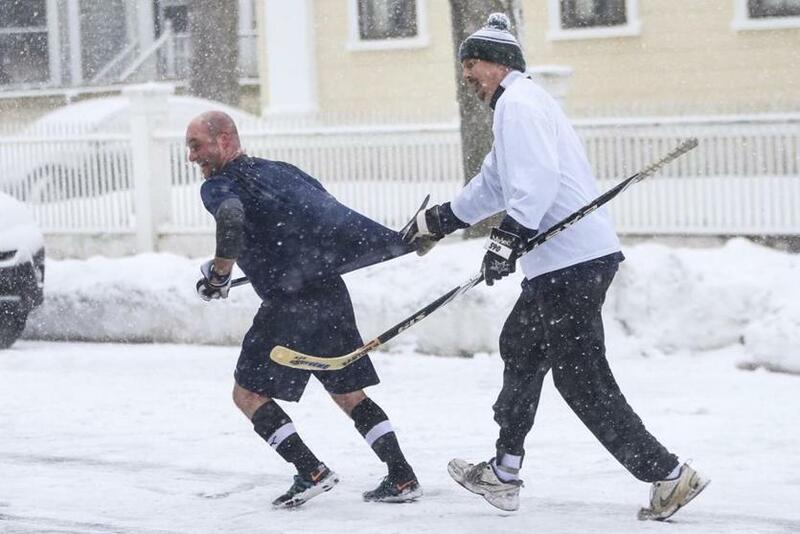 Playing through the snow is just one of the many charms of this street hockey game, which has been going on each Sunday of the winter in front of the same house in Salem for 49 years. The nets are carried out from a nearby driveway — the family that recently moved in lets them store them behind their garage — and are placed at angles against opposite curbs, somewhat delicately. They are handmade out of wood and chicken wire “because anybody can go out and buy a plastic net, but that’s not what this game is about,” said Ware Cady, who is the oldest of the current players at age 67. No, what this game is about is holding on to something. To tradition. To friendships. To children who grow up too fast. To a time when simple street games were a unifying force in neighborhoods. The Chestnut Street game started in 1970, at a time when street hockey games were a daily sight in the region, spurred on by the incredible popularity of a young Bruin named Bobby Orr who had just flown through the air after scoring an overtime goal to win the Stanley Cup. Jere and Bill Burns, brothers who were in their 40s at the time, launched the game in front of Jere’s house at 15 Chestnut St., mostly as an excuse to bond with their children, as Jere told a local paper a few years later. In the beginning there were two teams, the Chestnut Street Canucks and the Beckford Street Bruins, and they would occasionally take on a challenger from elsewhere in Salem. 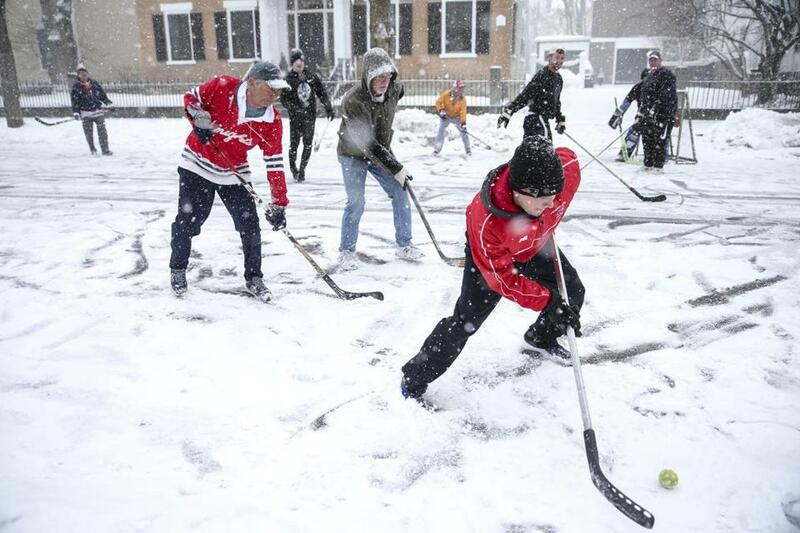 But as the children grew and moved on, it morphed into a pickup game that looks very much like it does today — fathers and sons, mothers and daughters, neighbors and strangers, all chasing a ball around the street, under parked cars, off fences and steps and snow banks. 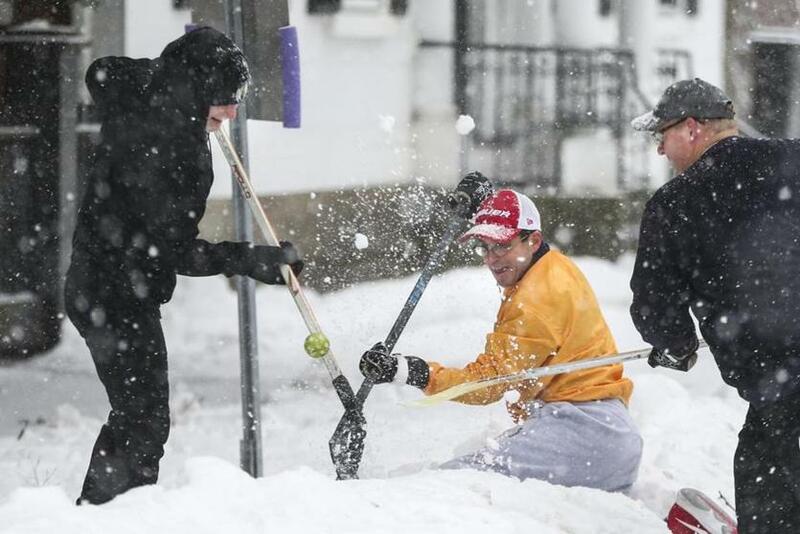 Aiden Gordon, Dave Stelluto, and Jim Whitehead competed for the ball stuck — and against a snow bank. The Burns brothers played into their 80s before passing on, and Bill’s son, Billy, still plays goalie, just as he was doing when the Salem Evening News showed up in 1976 to take some photos. He still uses the same goalie glove. With Billy Burns set in goal on this Sunday, the game began at a furious pace. The players, 14 of them on this day, range in age from their early 20s to mid-60s. A few have come up from Boston and nearby suburbs. One guy drives in each weekend from Worcester. The faces change each season as children come and go and people move away. Health problems sideline others. But they always seem to pick up a friend of a friend, or a newcomer to the neighborhood, or even strangers who walk by and want to hop in. Some Sundays, so many people show up they need to split it into two or even three games. Nearly everything is considered in play, and players on this day hopped snowbanks — piled high from a previous storm — to chase the ball on sidewalks, off trees, wherever. If it goes under a parked car — most neighbors know not to park on this stretch of the street on Sunday mornings — the sticks go under it, furiously trying to whack the ball to a teammate. They typically block the sewer drains to keep the ball from going for a swim and lay a broom handle under a fence to keep it from rolling into a neighbor’s yard. The snowbanks took care of those problems on this day. They have also begun wrapping pool noodles around the edges of a recently installed street sign, should anyone run into it. Still, the game is not without hazards; they seem to average about one broken bone a year. But the biggest danger of playing in the street is automobiles. Yet, thanks to a well-choreographed routine, no one has ever been hit. “Freeze!” someone yelled as the first car of the day approached, and the players pulled to the side of the road to let it pass. Chip Guiney tugged on the shirt of Alex Lawner to prevent him from making a cut to the net. Of course, they could buy a modern street hockey ball for a couple bucks, just as they could buy a net, or move the game to a schoolyard or an actual street hockey rink, “but it would lose its charm,” said Bryon Blaisdell, a 25-year-old from Peabody who has been playing since he was a child, along with his father, Bob, an attorney in Boston. An older brother, Stephen, 30, is the one who drives in each weekend from Worcester, where he is a behavioral analyst who works with children with autism. Yes, he said, he will often get strange looks when he tells people he drives an hour each way to play in the street, but he said the game has meant so much to him, and his family, that he is committed to making sure the game has a long future. Alex Lawner, right, congratulated bill Burns after he made a fantastic save.